Tigers & Strawberries » Eat Curry For Your Health! Eat Curry For Your Health! I’ve been reading articles about the health benefits of curry spices for quite some time, but this article from AlterNet is particularly good because it brings together summaries of the latest research on a variety of spices. Worldwide, a great many researchers are finding that spices commonly consumed in Indian curry dishes have myriad health benefits, corroborating the uses of these spices in Ayurvedic and other food, herb, and spice based medical traditions. While these findings are preliminary, all of the studies cited in the article have been published in respected peer-reviewed journals, so that other researchers can verify or refute the findings through their own studies. Cinnamon has been found, in relatively small doses (but still more than you would use in a curry or muffin), to lower blood sugar levels in adults with type II diabetes. The same study that reported this finding also noted that cinnamon reduces blood cholesterol levels. The dosage used to gain these effects in the study participants was just a half teaspoon daily. Turmeric, the spice which gives many curries their vibrant yellow color, has been used as a remedy for a wide number of ailments all over Asia for centuries. Recently, scientists have found that it may help keep Alzheimer’s at bay–patients who ate curry frequently, or even occasionally, were noted to have significantly fewer protein plaques in their brains. Mice fed a diet with turmeric were found to have 80 percent fewer protein plaques in their brains, and it was noted that curcumin, the active compound in turmeric, also reduced inflammation and cell oxidization. It has been found that the people of India have the lowest rate of Alzheimer’s in the world; currently research is being done to determine if this is caused by genetic factors or if it has to do with the large amounts of turmeric consumed in the typical Indian diet. Turmeric is also being investigated for its cancer-fighting potential. Apparently, it has been found to help block the growth of cancer cells while not harming normal cells. One thing to remember: curcumin is not water-soluble, so it is necessary to cook it in oil of some sort to gain its benefits. Do as the Indians do and cook it in ghee or oil before making a curry in order to extract the helpful curcumin, in addition to getting all the flavor and color of the spice into your food. Chili peppers not only have their widely known antiseptic properties, but have also been found to have the ability to shrink tumors and inhibit the growth of cancer cells. Capsaicin, which has been used to relieve the pain of arthritis when used externally, also may have the potential to help fight obesity when taken internally by boosting the metabolism. Ginger has been a popular folk remedy for nausea, particularly morning sickness for generations, but finally, it has been proven that the effect is not related to mind-over-matter or a placebo effect. In addition, this relative of turmeric is also being found to have the potential to lower blood sugar, cholesterol and to protect the stomach from ulcers. It also has anti-inflammatory properties which would make it valuable in fighting the pain and swelling of arthritis. 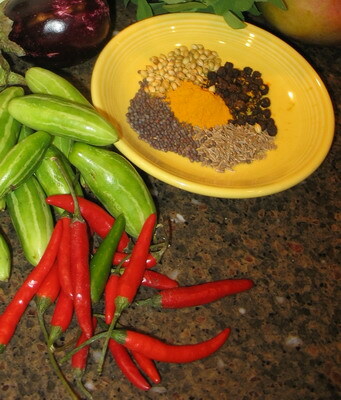 Generally, I eat curry because I love the many flavors, textures and colors inherent to this broad spectrum of dishes. But, I have to admit that I am even more keen to eat it now that I see that the Indian assertions that curry is healthy are not just based on tradition, but sound scientific research as well. And, I have to also admit that I am very happy to see Ayurvedic traditions being proven through the application of the scientific method. It just goes to show that just because a medical system is ancient, doesn’t mean that it is just folklore or old wive’s tales. Many ancient medical traditions are based just as much on experimentation and observation as modern allopathic medicine. So, do as I do, and eat a lot of curried dishes, not only for pleasure, but for your health! Hi, I’ve been reading for some time, but this is my first comment. I have been really interested in Indian cooking for some time, but especially since finding out i can’t eat wheat. I got a lot of ingredients, including a number of different dals, poha, curry leaves, methi seeds, and have a pretty extensive spice collection, but honestly, the first few things I tried were sadly far too hot (spicy) for me. Do you have any recommendations for curries that are good for beginners? Or basic sambhars? I did make some idlis from a mix that were super yummy, and some rice dosas that were a big hit. I just need to get the curries figured out now! 🙂 thanks for your great blog! Gaile: Curry is a blend of spices, which include varying amounts of each item. Capsicum, which gives it its hotness, can be eliminated altogether if you are making your own curry blend, or buy a mild curry blend at the store. Hope that helps. Also, FYI, hotness is an acquired taste. Each time you eat something hot, it allows you to eat a little hotter the next time, as though you were training the mouth. Gaille–leave out the chilies to start out with, or drastically reduce them in any recipe you use. If that doesn’t make it so you can eat it, you may need to reduce the amounts of ginger and black pepper as well. I concur with everything Valerie said–it takes a while for you to work up the ability to eat chili hot foods. Look in my index of Indian foods or in the category of Almost Vegetarian, Vegetarian and Vegan recipes for simple, not too spicy dals and vegetable dishes that are not going to hurt your tongue! thank you both so much! I will dive into the Almost Vegetarian, etc category and give it a whirl! I love, love, love Indian food. It is my favorite cuisine. When I’m heating my lunch at work, one of my friends always comes and glances at it and says, “Let me guess, curry again?” I don’t think he realizes it’s a cuisine and not a single dish over and over and over again. I think since I started making Indian food all the time, my general eating style has become healthier. It’s grand to know that it’s even healthier than I thought. Galle: just adjust the chili count down to your own taste. If you make the masalas (curry spice mixes) from scratch, you can add as much or as little chili as you like to it. I love hot food, but I do the same. For example, tonight I made a South Indian liver curry – and it called for 4 tsp. of chili powder (!). Now I love chilis, but I didn’t want sear-your-head-off curry tonight, so I bumped that down to one tsp. It was lovely. Next time I might add 2 tsp. or even the full 4. Or not. The glory of Indian cooking is that each spice mix is individual, o you can adjust to your own taste.